Fabian Klose (ed. ), The Emergence of Humanitarian Intervention. Ideas and Practice from the Nineteenth Century to the Present, Cambridge 2016. 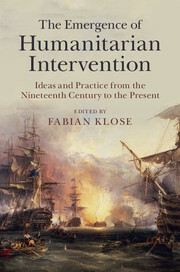 This entry was posted in Actualités / News, Books and tagged Human Rights, Humanitarian Intervention, Humanitarianism, International Humanitarian Law by Fabian Klose. Bookmark the permalink.